Exploring Vesterheim’s Main Building with its four floors of incredible artifacts is a delight. Wandering at your own speed, you can linger for as long as you wish at your favorite pieces. 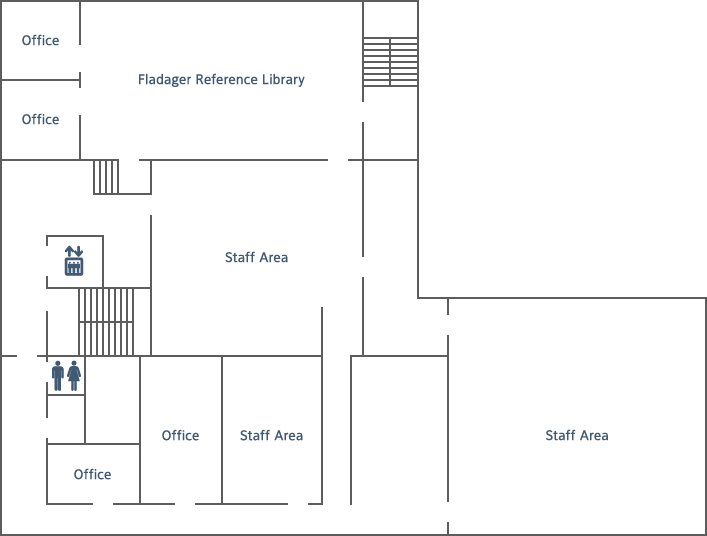 For more detailed information on Vesterheim’s hours, admissions, parking, and more take a look at the Visit page. These itineraries were arranged in case you wish to narrow your emphasis to a certain theme or are limited on time. 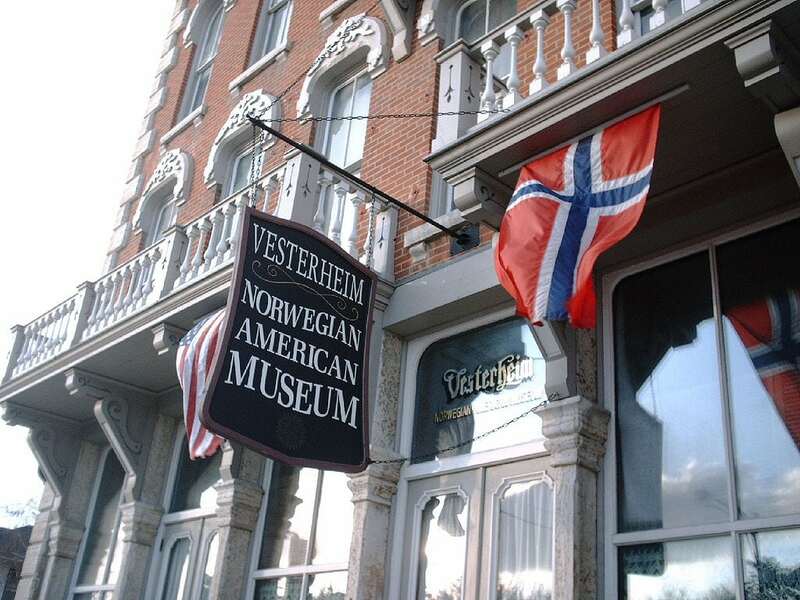 Some itineraries focus only on Vesterheim’s exhibitions, while others give you ideas for spending time in Decorah and the surrounding area. However you choose to revel in Vesterheim’s vast galleries, enjoy! Vesterheim | Want to see a specific object? It could easily take a whole day or more to see everything at Vesterheim. If you are short on time, you won’t want to miss these standouts on any Vesterheim tour, but fair warning—there will be a lot of other wonderful things on the way that may distract you. You can view these objects within one hour. Even if you are unable to attend the guided tour, it is worth wandering the grounds and reading the placards outside each of the 12 buildings. An impish nisse, made of concrete, that was made in 1954 by Halvor Landsverk, a well-known wood carver and sculptor from Whalen, Minnesota. This special battalion, which was activated in 1942, consisted of 1000 Norwegian-Americans who were trained to liberate Norway from Nazi control. Christenson began carving this altar in 1890. Ten years later, when the altar was completed, the congregation for which he carved it did not accept it. One theory is that it varied too much from the more popular style of the time. The church subsequently burned, but the altar did not since it continued to be stored at Christenson’s farm. This house is a model of a rural Norwegian home from the mid-1800s in the Telemark region of Norway. This 25-foot sailboat, the smallest known sailboat to have crossed the Atlantic Ocean without assistance, was sailed by two brothers who left Kristiansand, Norway, on March 27, 1933, and arrived at the World’s Fair in Chicago by August 29, 1933. A door painted by Per Lysne on location in the St. Paul home of Eleanor Ericson in 1939. 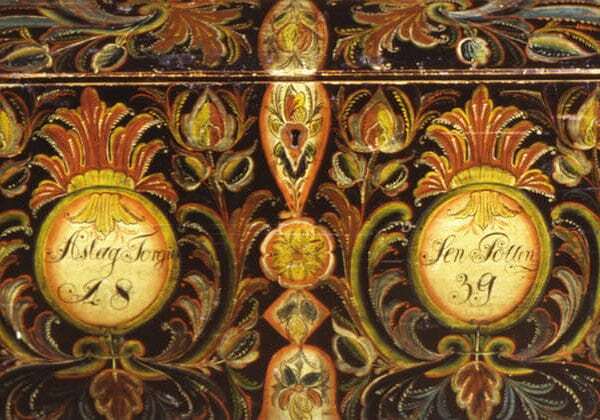 Lysne was a decorative painter who was originally from the Sognefjord area of Norway. A bowl turned by Gary Smith. The exquisite chip carving was done by Miles Lund, a Vesterheim Gold Medalist. A drinking horn carved by Lars Kinsarvik (1846-1925), a major figure in the revival of dragon-style carving, which became popular after the excavations of the Viking burial ships in the late 1800s in Norway. A silver traditional bridal crown that dates to the 1700s. A seventeenth-century Norwegian tapestry that depicts the biblical parable of the Wise and Foolish Virgins as told in the book of Matthew. Vesterheim is a great place to visit with kids. You can share with them your own family history as you explore the immigrant story. Best of all, Vesterheim is a place you can step into your own imagination! Touring the museum with children on average can take anywhere from ½ hour to three hours. Johanna, Claudia, and Ruby love coming to Vesterheim to create a different life for themselves. They choose new names when they come through the door and take their picture in front of the Norwegian fjord mural in the lobby. Their visit wouldn’t be complete without a walk outside through the Heritage Park of 12 historic buildings when they are open. Even when the buildings are closed, they love to peek through the windows and imagine life in times past. Another elevator ride brings them to the basement, where they love sneaking through the stone-walled hallway. They check out the nisse statue, the old-time children’s toys, and the open storage of intriguing artifacts and artworks. Sometimes they pretend there’s a wedding in the church gallery. Moving into the museum, they put on the traditional Norwegian costumes hanging next to their “native” Norwegian house on the first floor. They like to imagine their family life in Norway and why they might need to go to America. Next, they wander through the ship room and pretend to take the long journey in a boat over the ocean. They clamber into the tiny bunks and climb the stairs to look out over the sea with binoculars. Upstairs, they enter their log cabin in America and marvel over their good fortune of finding a new home. They love traveling up the elevator to the third floor, looking over the balcony down into the ship gallery and exploring the interesting special exhibitions. Since they are in Decorah, they have to visit some of the town’s great parks, like Phelps Park or Dunning Springs, where there’s a wonderful waterfall. Or they take a bike ride on the 11-mile Trout Run Trail. 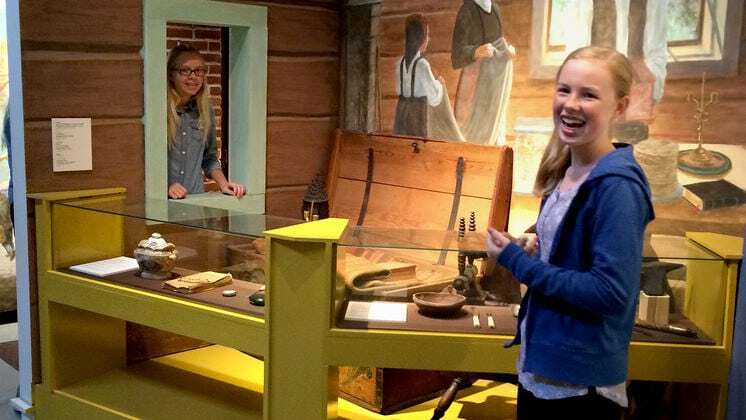 These kids love to roam through old-time-yet-modern downtown shops, play on the hilly lawn surrounding the historic courthouse, and visit the Porter House Museum’s stone wall, where they look in the secret stone crevices for pennies. When it comes time to eat, they recommend Magpie Coffeehouse and T-Bocks Sports Bar and Grill. If you spend the night, they love camping at Decorah’s award-winning Pulpit Rock Campground, right outside of town on the scenic Upper Iowa River, or checking into one of Decorah’s great hotels, two of which have indoor swimming pools. But they are especially excited about staying at the Hotel Winneshiek, where the historic setting and fancy décor allow them to continue to use their imaginations and make their own histories. 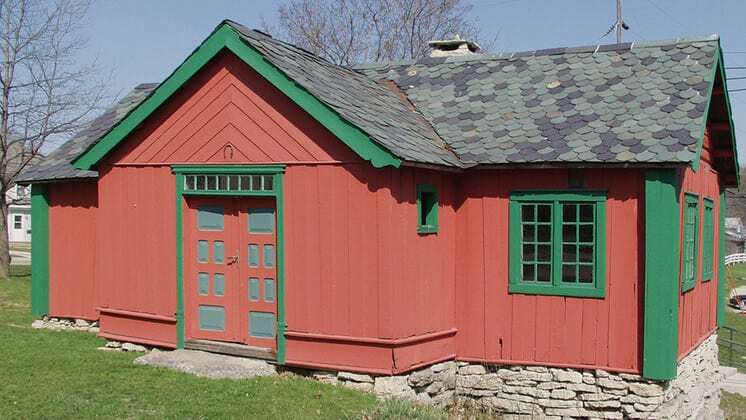 Vesterheim in Decorah is a perfect family get-away any time of year. USA Today named Vesterheim one of “ten great places in the nation to admire American folk art” and it is a “must see” destination for folk artists and folk-art lovers. 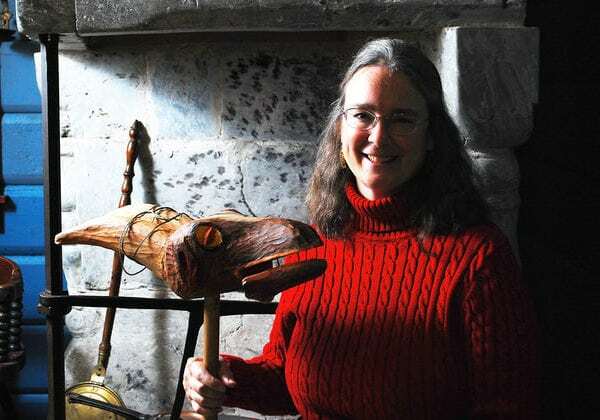 Patti Goke is a Gold Medalist rosemaler who comes to Vesterheim to be inspired by the museum’s world-class collection of artwork and the artist community she meets here. She likes to take folk-art classes at Vesterheim and shop in the Museum Store. Patti travels from Minnesota, south on Highway 52 and, whenever possible, she likes to stop at the antique mall in Harmony, Minnesota, a few miles before she crosses the Iowa border. The antique mall is on the left hand side of the road when you first come into Harmony. For Patti, choosing favorite artifacts to see in the museum is like picking out a favorite child. However, two pieces that she enjoys seeing and studying often are the big Agder trunk and the trunk painted by Sebjørn Kverndalen. She is always a bit in awe of where inspiration comes from. She can see pieces many times over and yet, when spending time in the presence of the old pieces, there is always something to spark the imagination. Patti is an eagle-holic. She loves watching the Decorah eagles web cam, but seeing them for real is even better! Any time of year, she drives to the nest just south of Decorah at the Fish Hatchery to see how things are going for two of Decorah’s most well-known denizens. She likes to walk along the river on the paved Trout Run Trail. The trail head is on the west end of Main Street, just a few blocks from Vesterheim. It is also a good place to have a picnic. If it is summer, watching the fireflies over the Upper Iowa River or the Decorah Prairie is an absolute must. 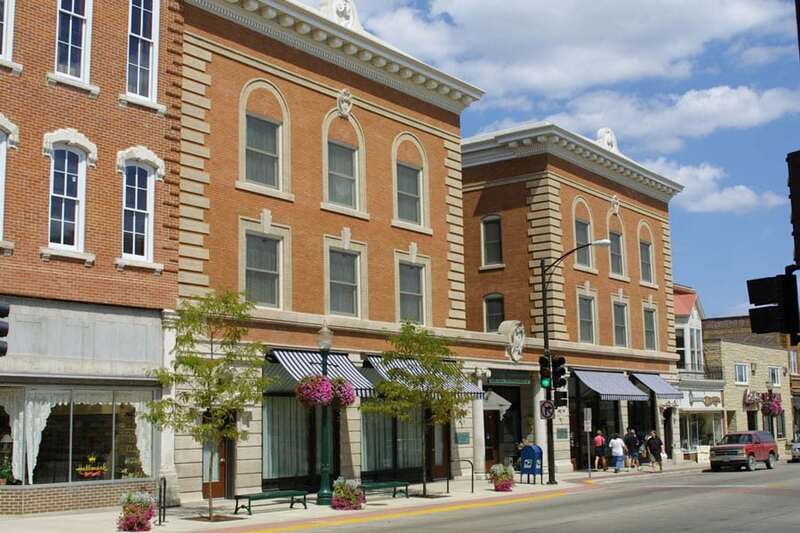 Decorah is known for its quaint small-town main street filled with modern fun shops. Patti usually checks out the sale racks at locally-owned Margaret’s Boutique. She has found unique fashions that she hasn’t seen anywhere else. Decorah hosts the fantastic Winneshiek Farmer’s Market that’s open in downtown Decorah on Wednesday afternoons and Saturday mornings from May 1 through October 31. Patti feels lucky when she’s in town during the market and she likes to go there to buy fresh fruits and vegetables, and sometimes lefse. Patti starts off her mornings in Decorah with a cup of coffee from the Oneota Community Food Co-op. She says to make sure to get a free stamp card to earn a free cup of coffee. Sometimes she treats herself to a chocolate fudge oatmeal bar. If she doesn’t bring food from home, she likes to buy lunch at the Co-op. Her favorite panini is the Turkey Mango Madness. If you’re staying a few days, get yourself a stamp card for wraps and paninis. Their hummus is great, as well as many of their deli salads. The Co-op is also a good place for a wi-fi connection. If she is in the mood for pizza, it’s a hard choice between Mabe’s and McCaffrey’s Dolce Vita. Mabe’s is right downtown, and McCaffrey’s is just outside of town past Twin Springs and the pretty ride to get there is worth it. A new favorite place to eat is the Old Armory BBQ, just across the corner from Vesterheim’s Westby-Torgerson Education Center. Check out their fantastic lunch specials. Award-winning author and historian Kathleen Ernst visits Vesterheim often, and, in fact, one of her mystery novels is set at the museum. Kathleen writes American Girl mysteries for young readers; a museum mystery series for adults; and American Civil War books for adults and young readers. Reading her work, it is clear that Kathleen loves history and she thinks Vesterheim has a lot to offer. Kathleen enjoys rosemaling classes, Vesterheim’s annual celebrations, and wandering through the museum’s collections. Kathleen says, “Vesterheim’s collection includes exquisite pieces of different styles, and the museum’s class schedule offers lots of diversity as well.” Readers of Heritage of Darkness, her book set at Vesterheim, will especially enjoy checking out key museum artifacts and galleries from the book. There’s an important trunk in the Norwegian House on the first floor and the Valdres House in the Heritage Park creates the setting for an exciting scene, as well. You’ll have to read the book to find more fun connections. After a day of enjoying the museum, a folk art class, or writing, Kathleen loves to take a walk through Decorah’s historic neighborhood on Upper Broadway. She says that the number of historic homes is impressive, but even more so is the diversity of styles of architecture. Kathleen’s favorite local haunt is Java John’s. The staff are friendly and helpful, the coffee is great, and pastries and quiche make a lovely breakfast or lunch. She also appreciates the many electrical outlets and the three-room layout, which provide the right setting for whatever you’re in the mood for. She wrote several portions of Heritage of Darkness in the back room, while enjoying a mocha latte and an herb-cheese scone. Her next favorite local haunt is the Oneota Community Food Co-op, where she usually goes for lunch. 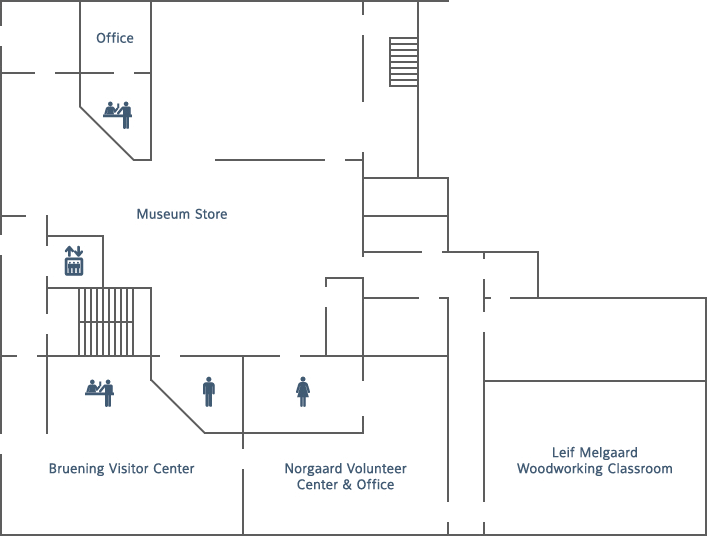 Great food, including a terrific salad bar, is available every day and it’s very convenient to the museum. As a vegetarian, she appreciates knowing that she will always find delicious choices. Is there something you are especially interested in seeing at Vesterheim? 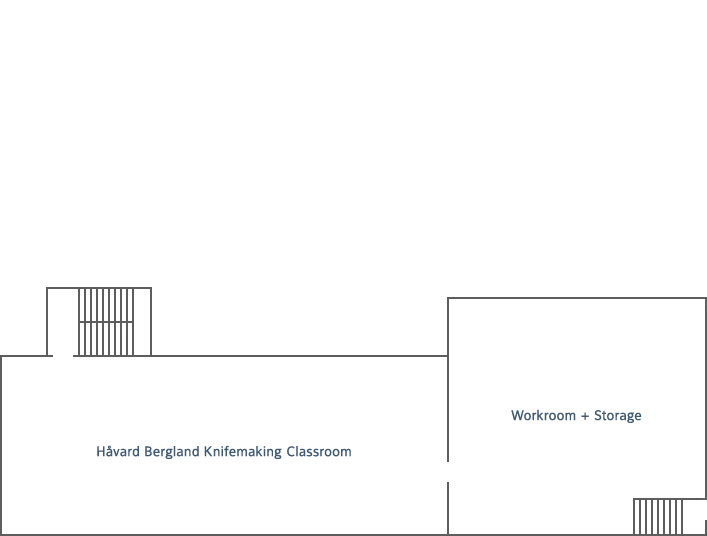 With a collection of over 33,000 artifacts, many of Vesterheim’s objects are in storage, but we’d like to make sure you have access to your special piece. Did your family donate something to the museum? Do you have a favorite artifact you would like to see again? Is there a certain folk-art technique you’d like to study? If you have a specific viewing request, please contact Vesterheim before you visit to assure access to the collection items you would like to see or study most. 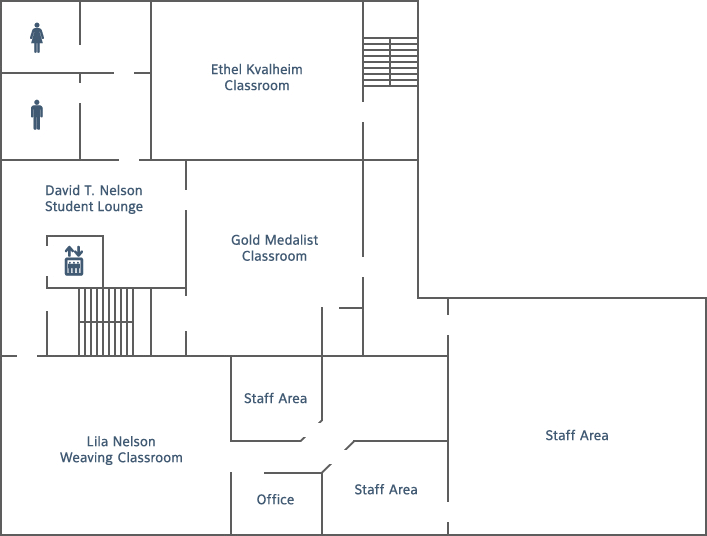 Viewing requests can be sent to info@vesterheim.org or 563-382-9681. Two weeks notice is preferred.